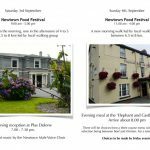 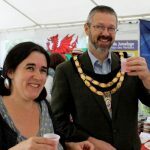 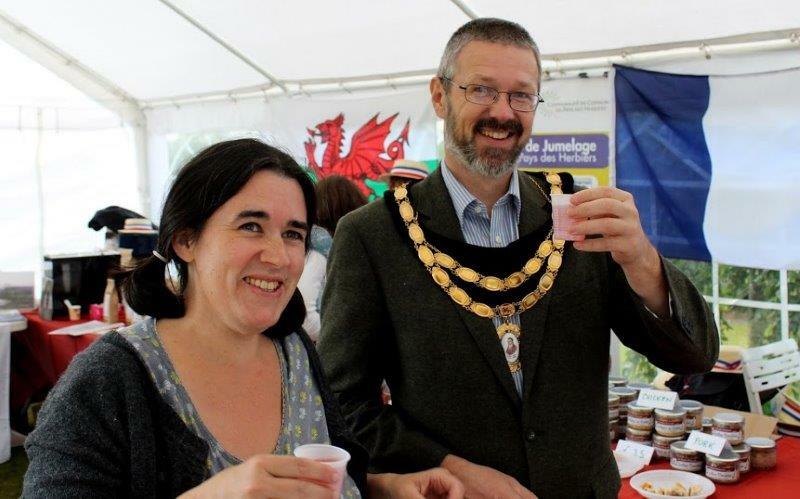 After the success of last year’s food festival in Newtown, it was always going to be a risk to follow on with another weekend to remember, but events proved otherwise. 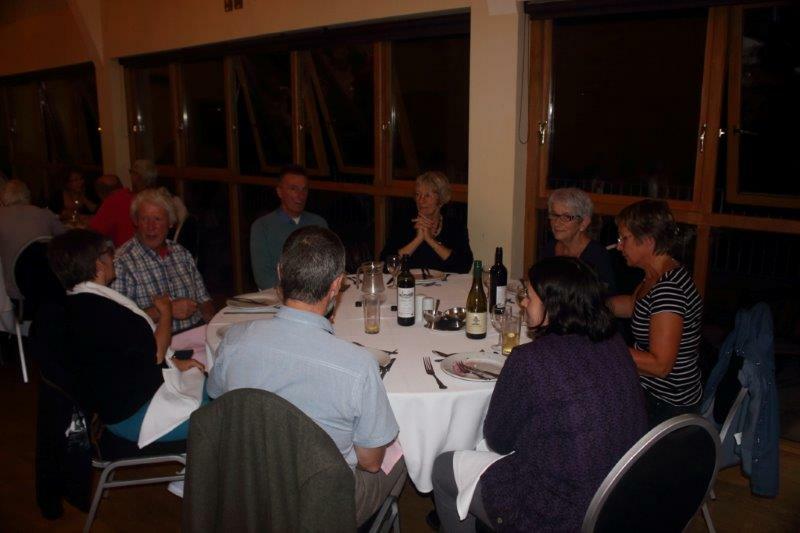 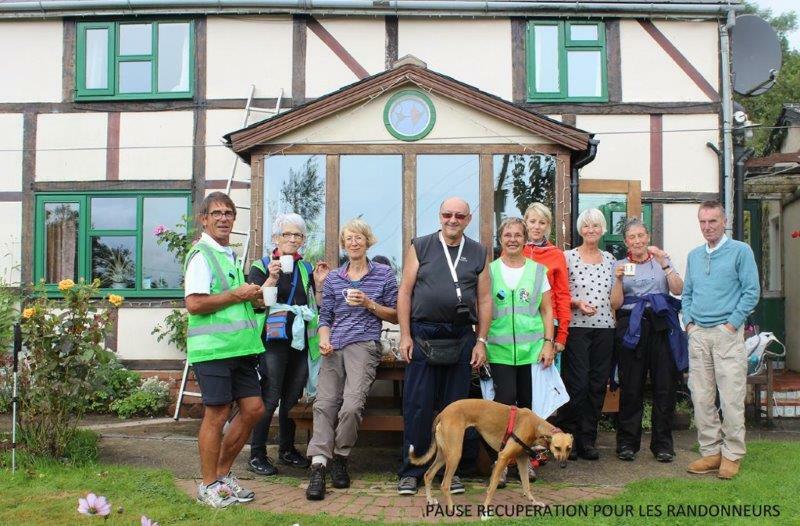 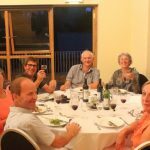 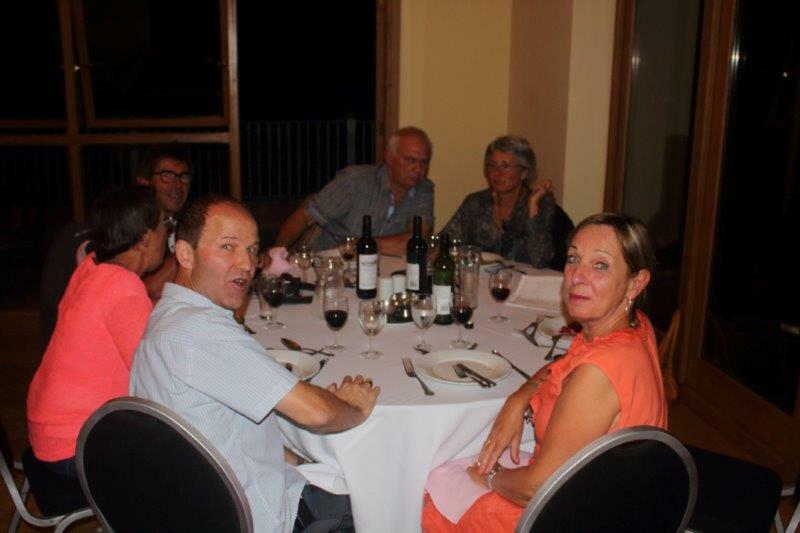 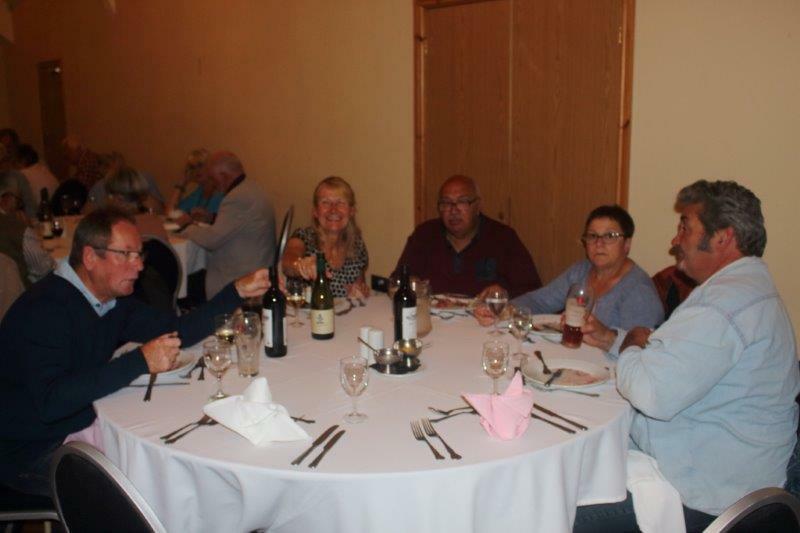 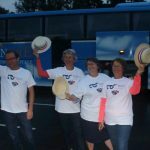 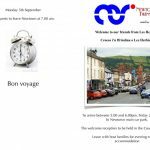 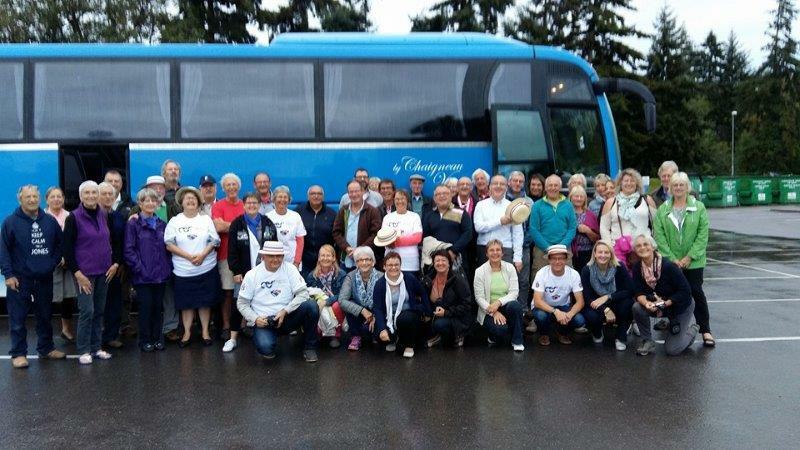 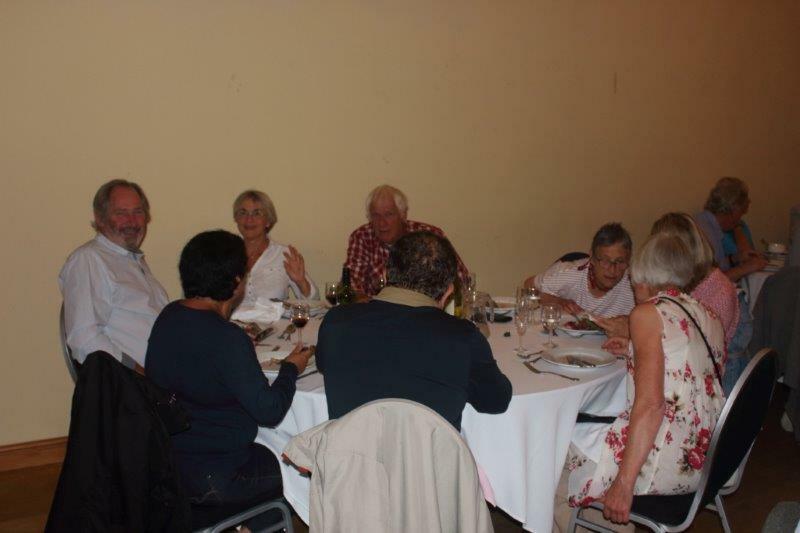 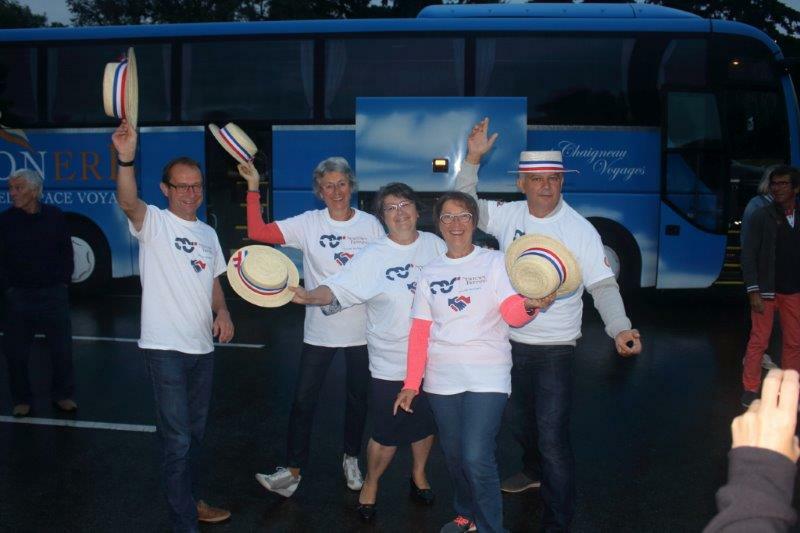 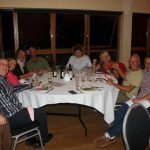 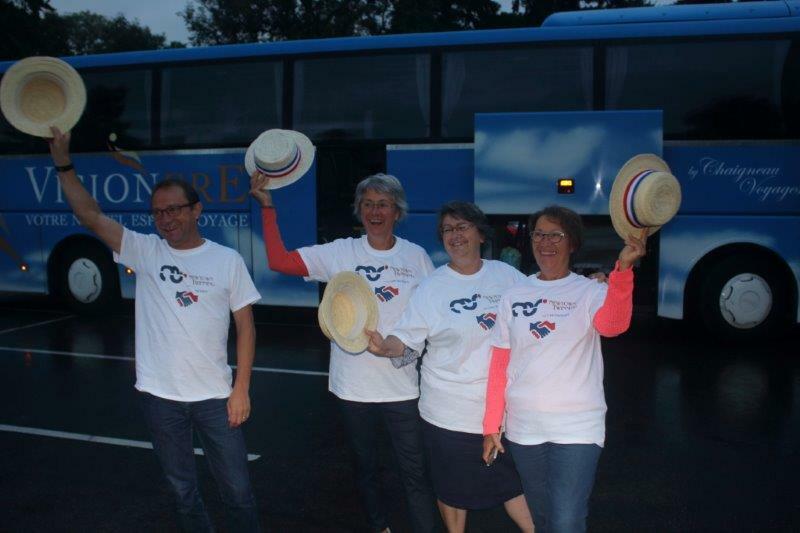 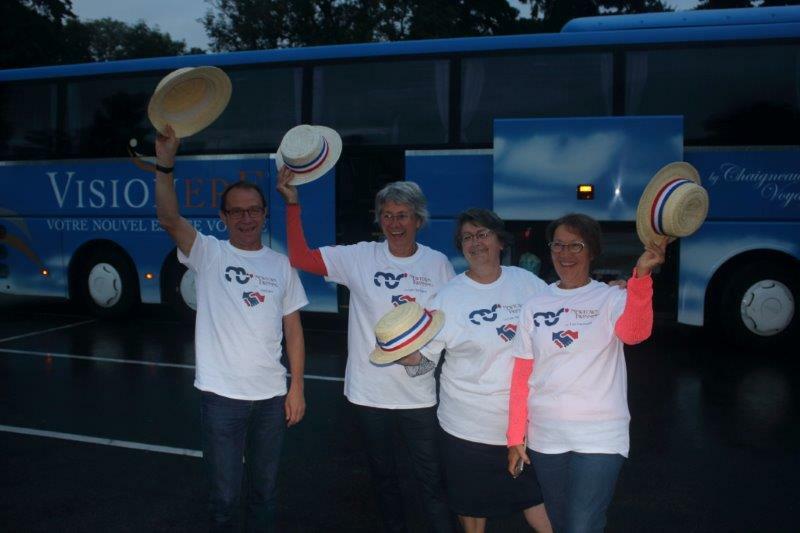 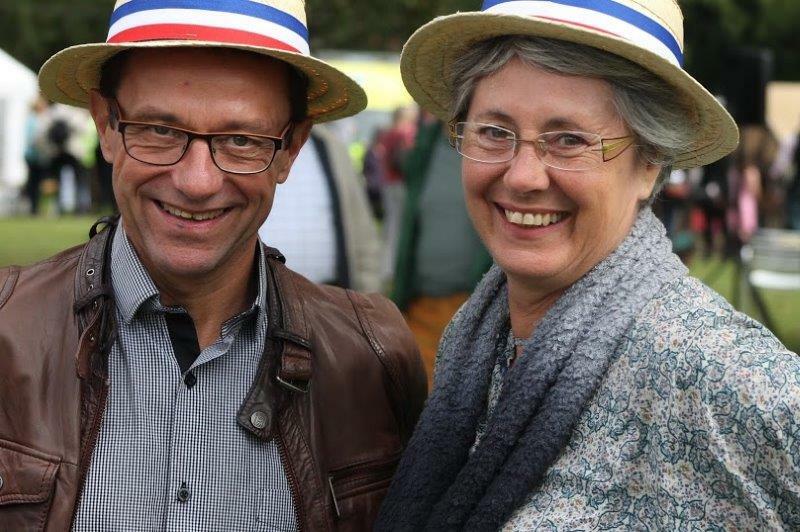 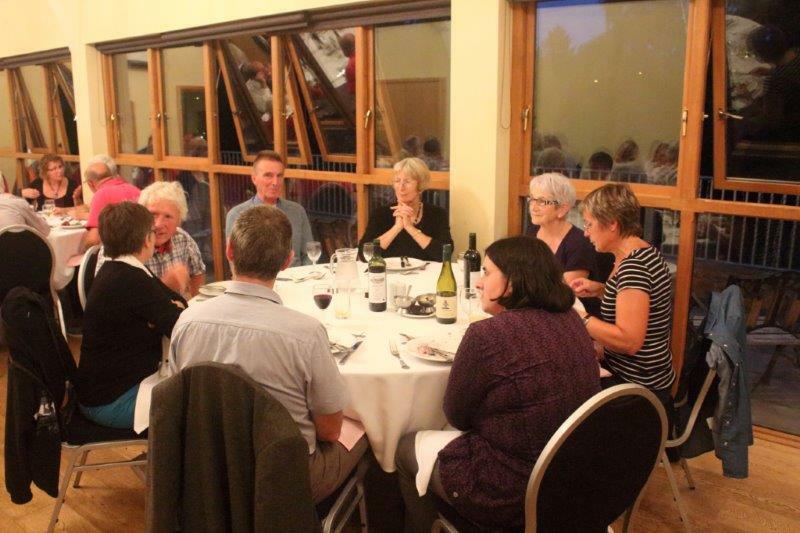 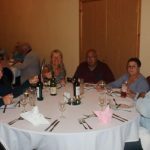 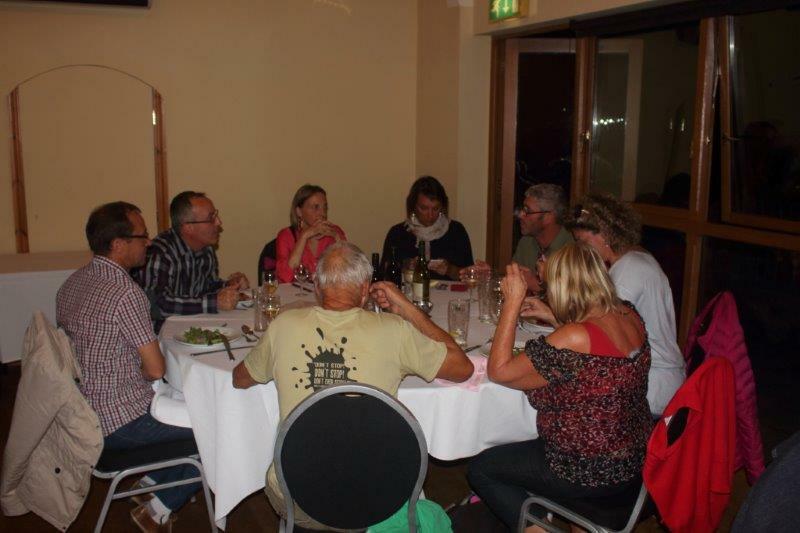 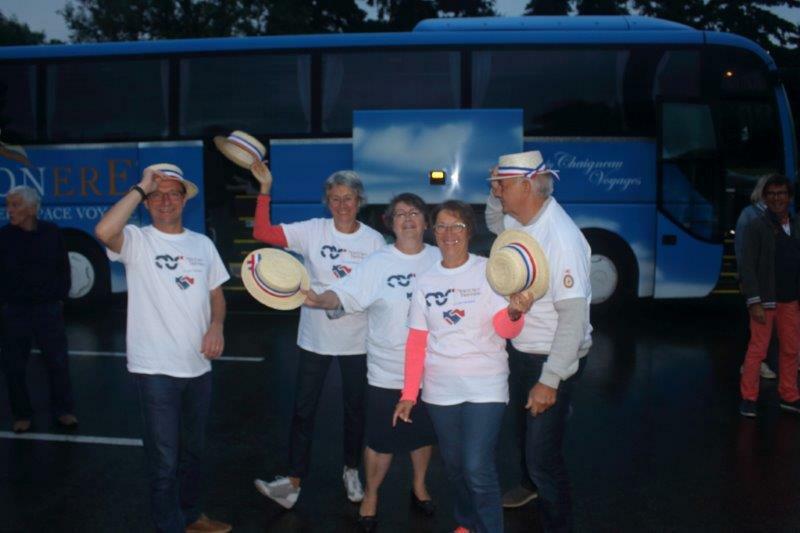 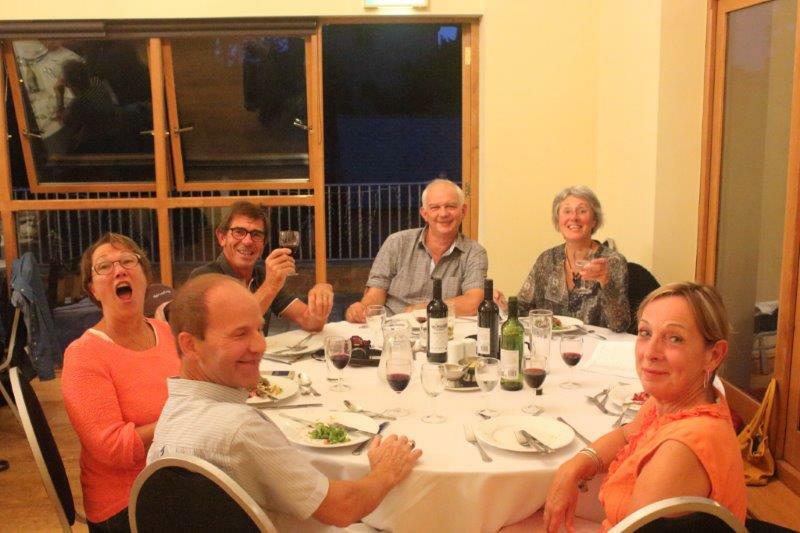 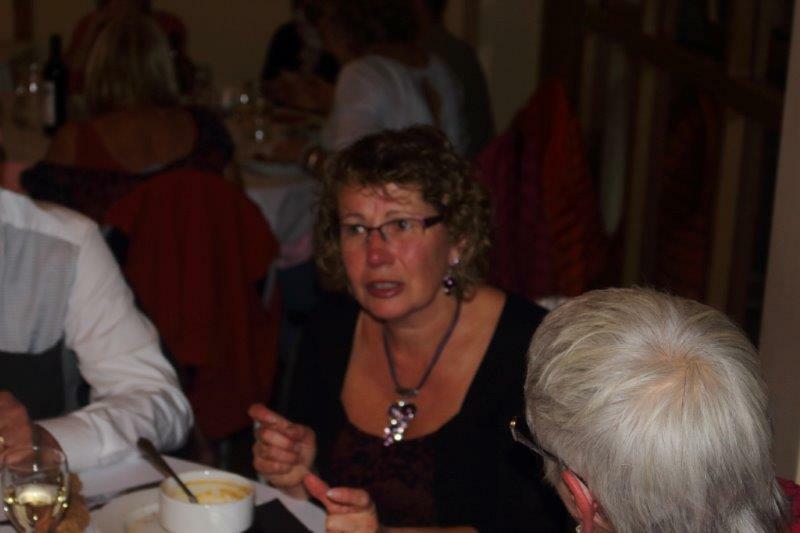 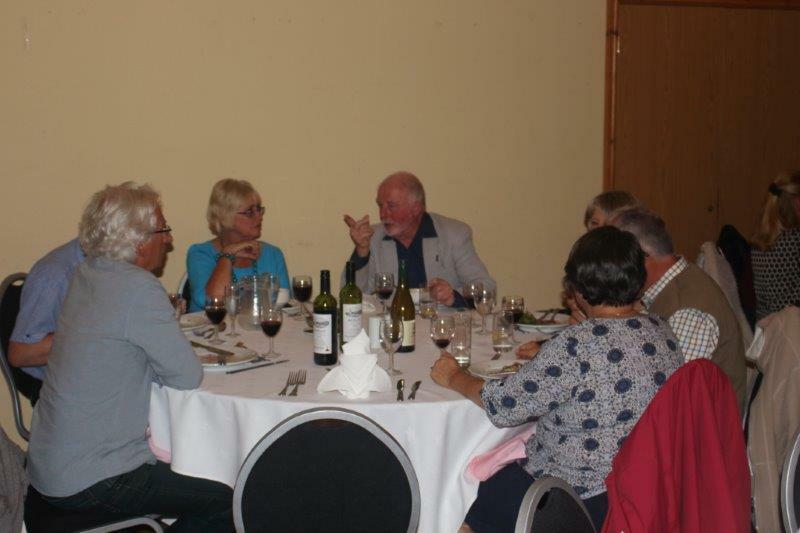 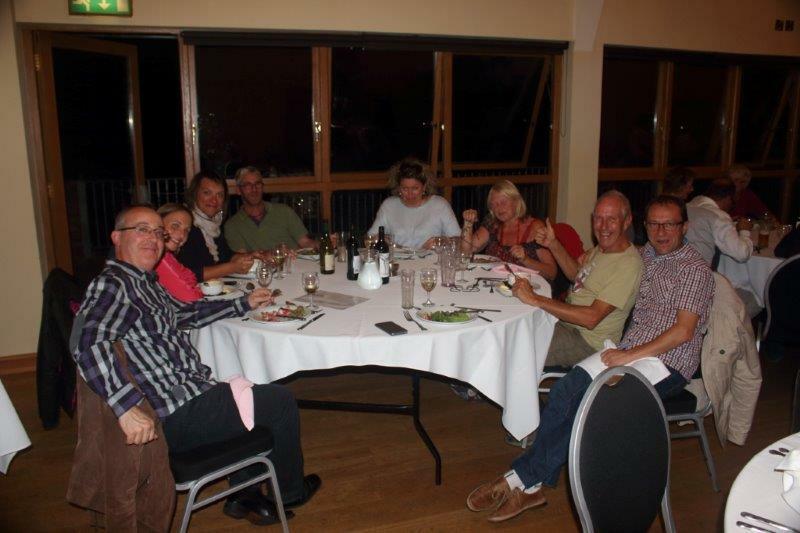 Our French visitors arrived on the Friday evening 2nd September, after a pleasant sojourn in Tewksbury on the way. 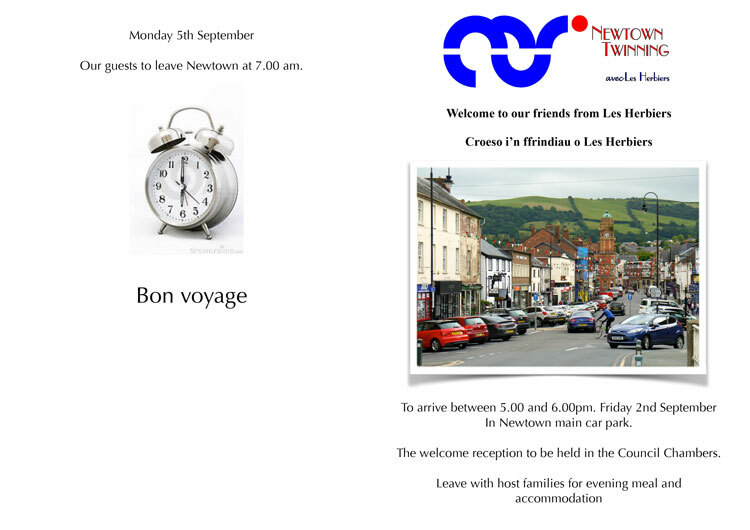 After greetings and a mayor’s welcome , our guests were whisked away for their first evening with their host families. 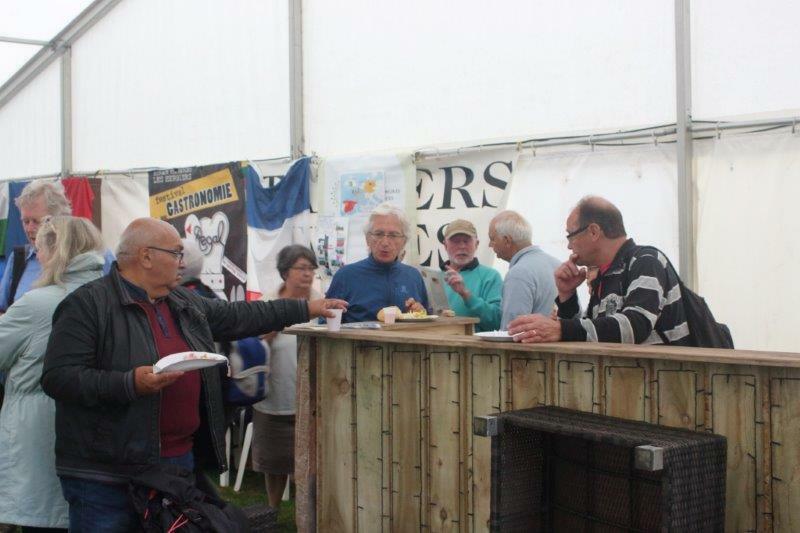 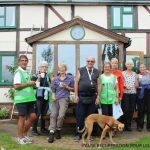 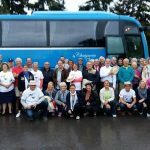 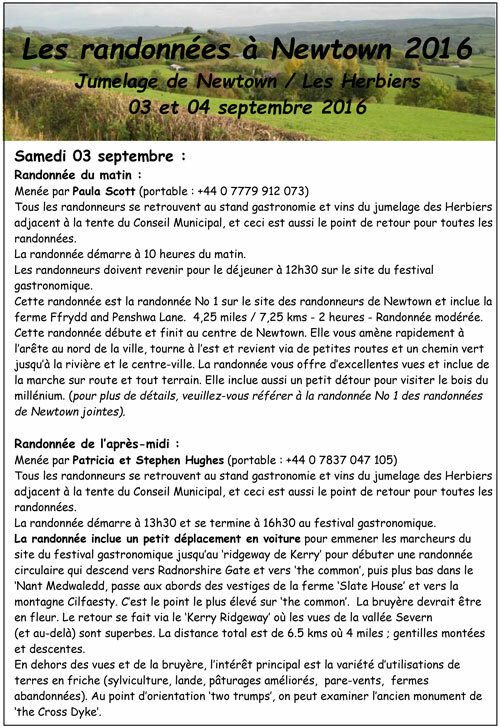 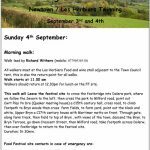 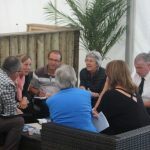 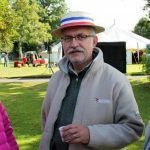 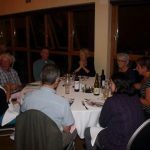 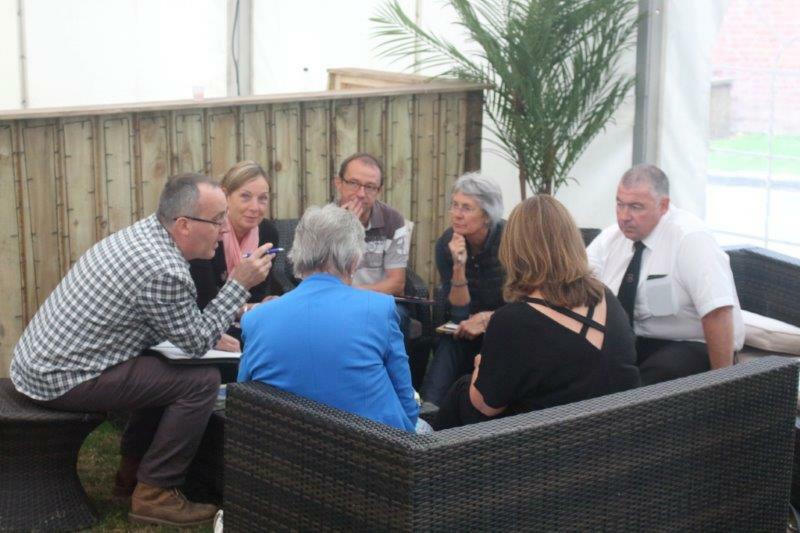 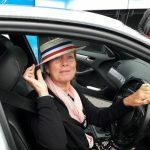 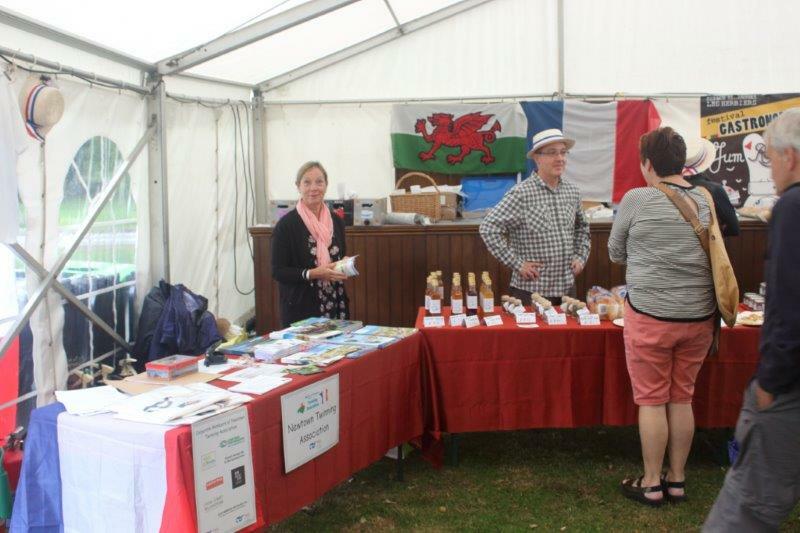 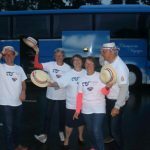 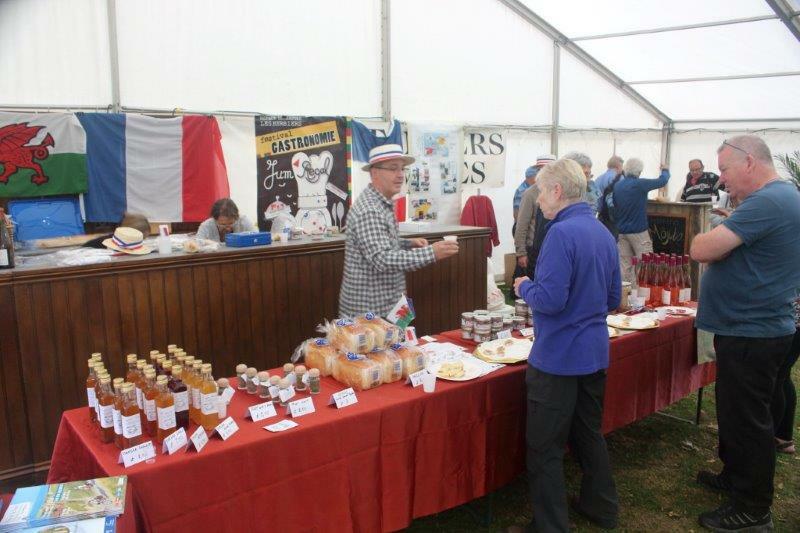 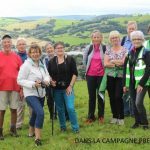 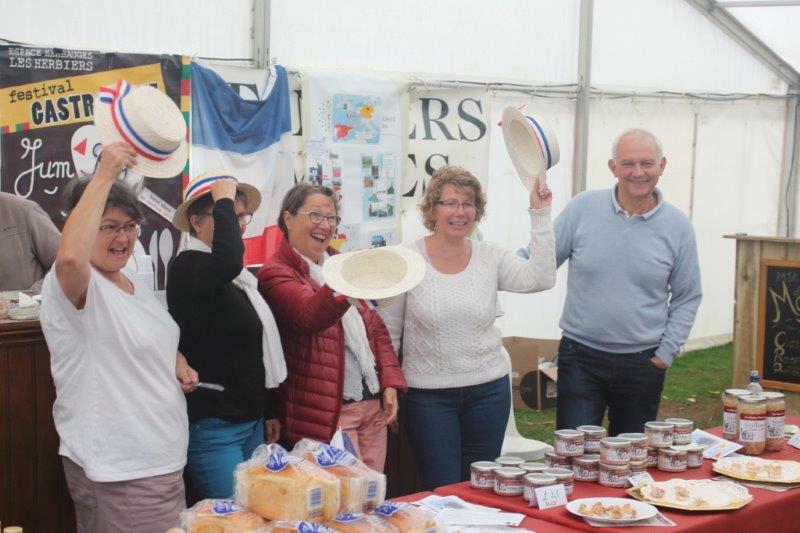 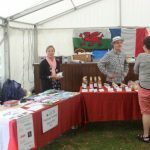 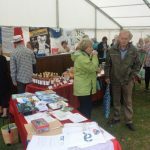 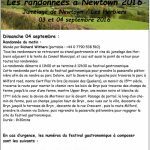 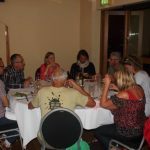 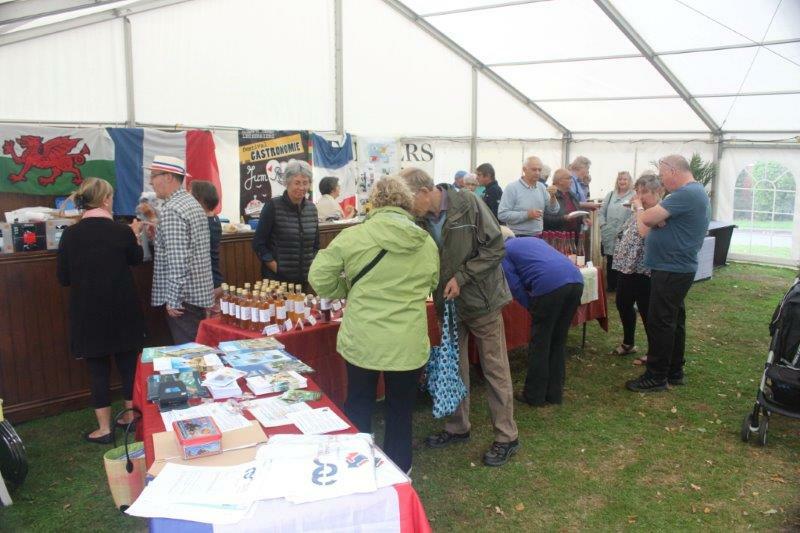 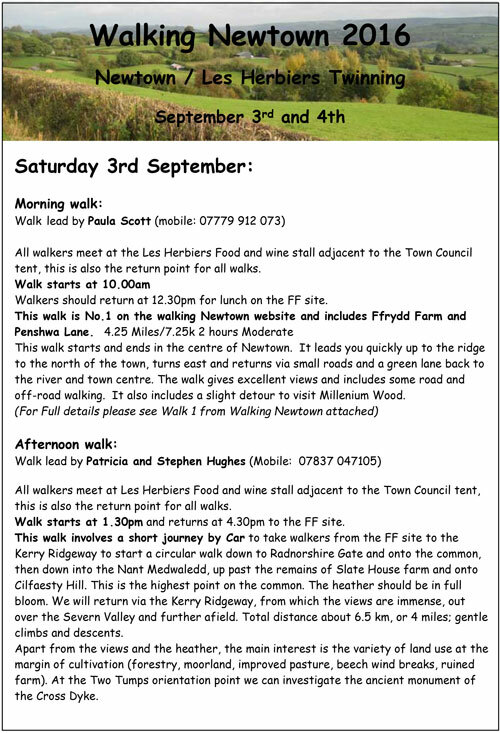 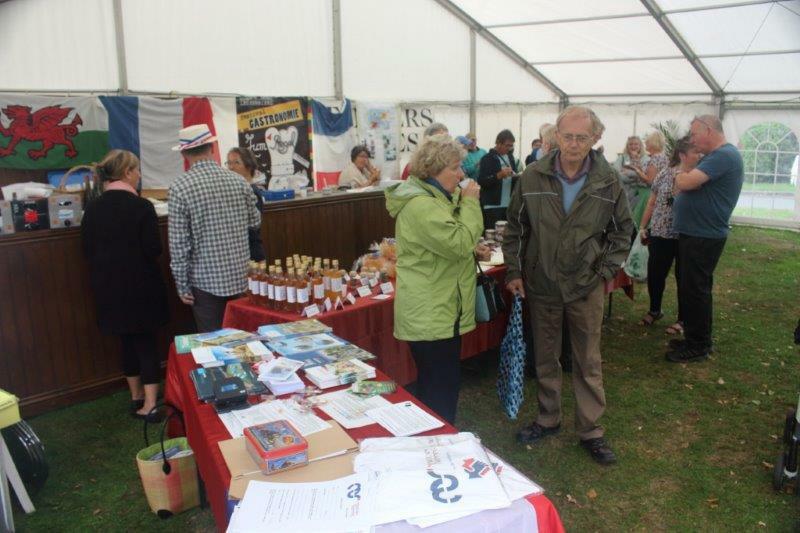 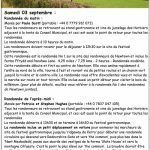 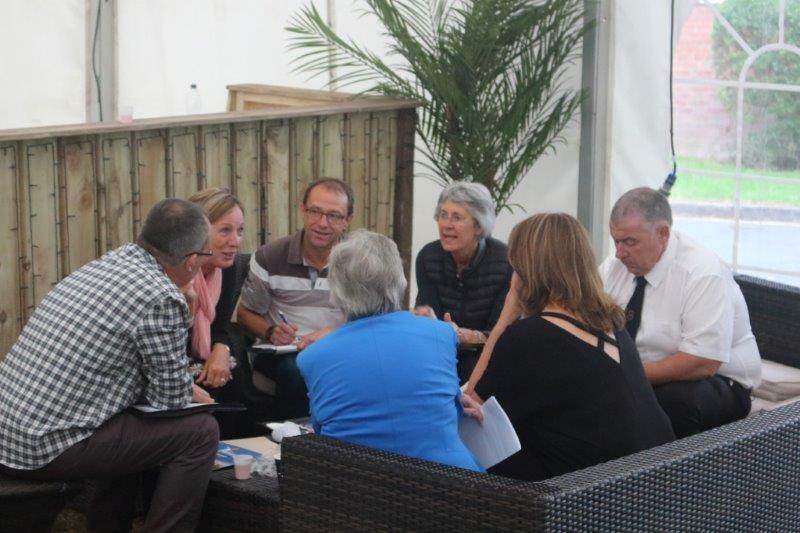 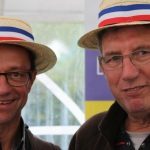 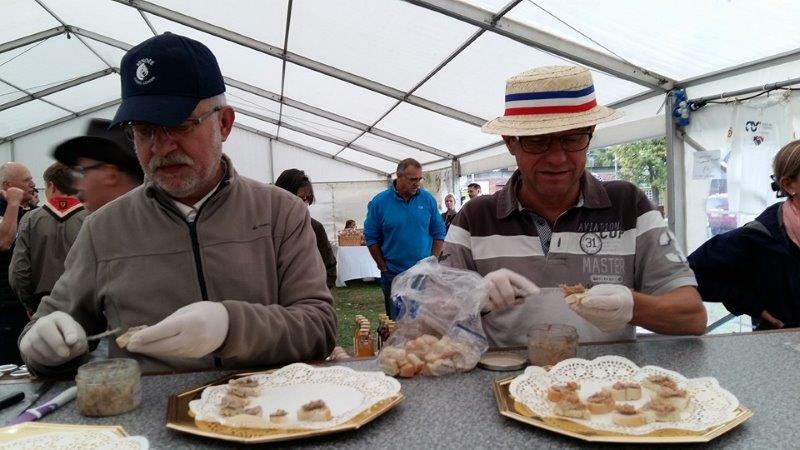 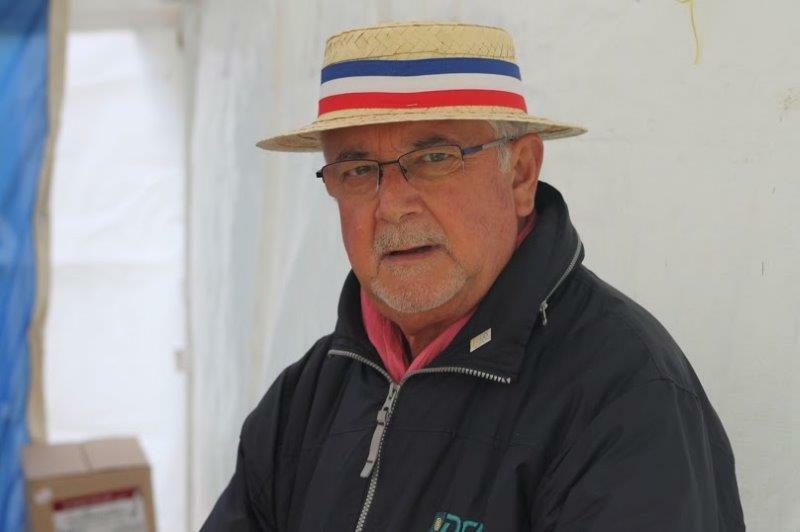 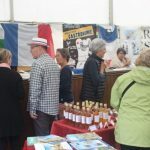 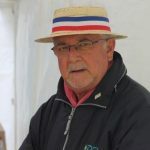 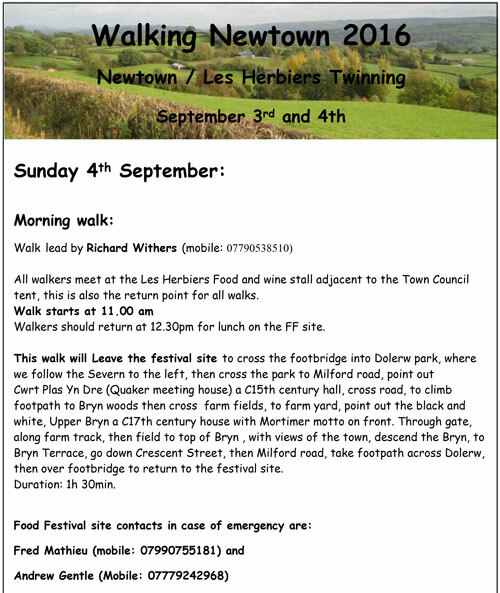 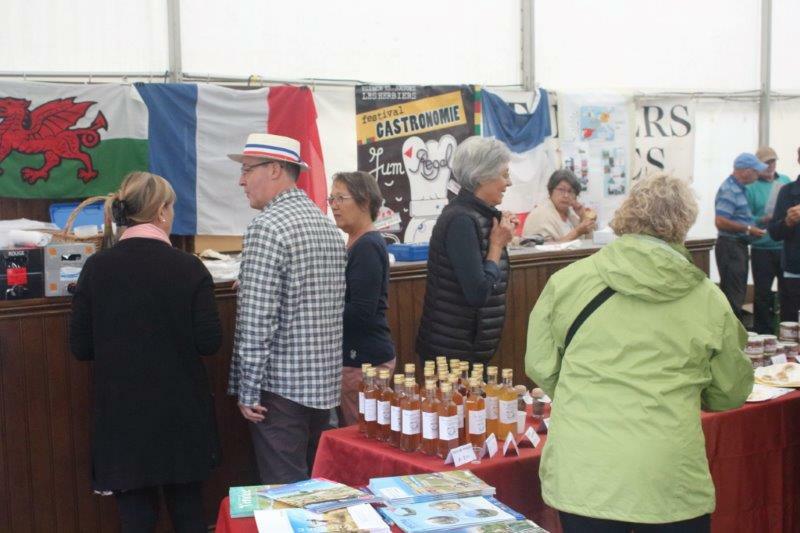 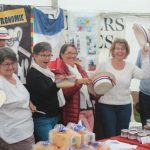 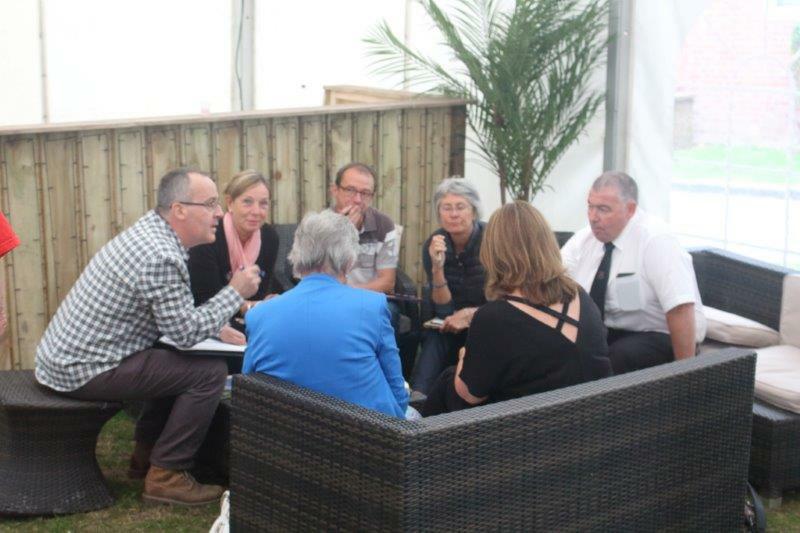 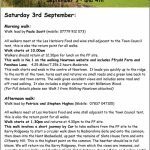 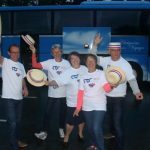 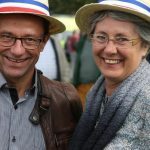 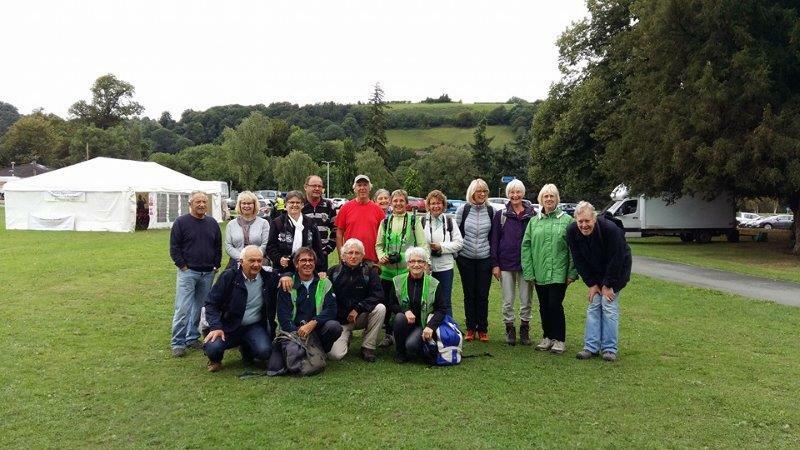 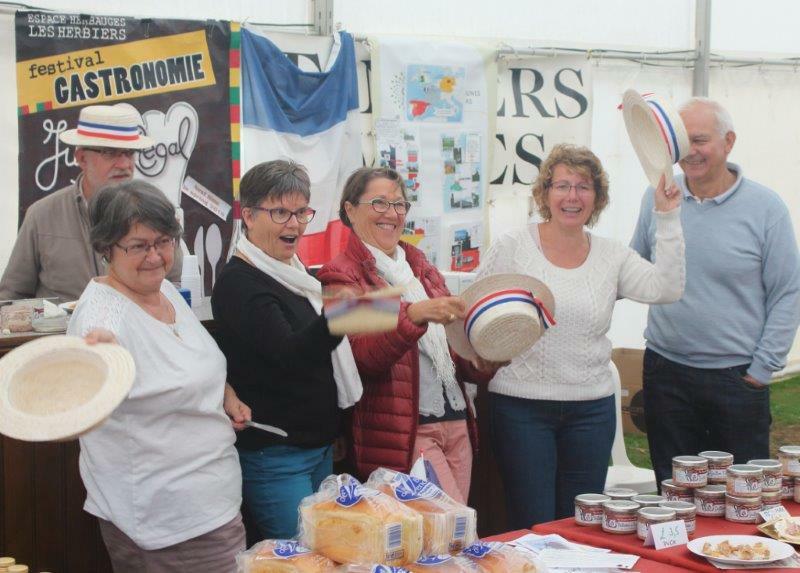 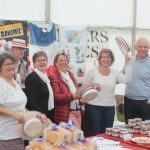 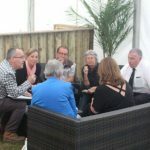 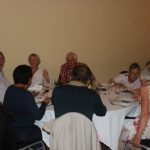 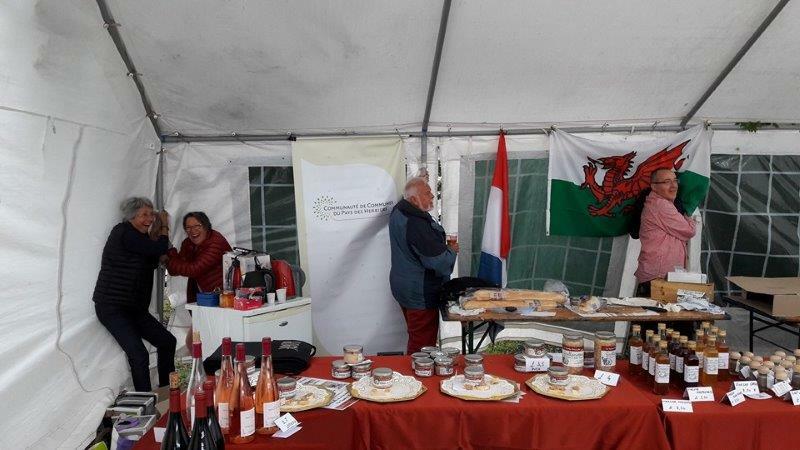 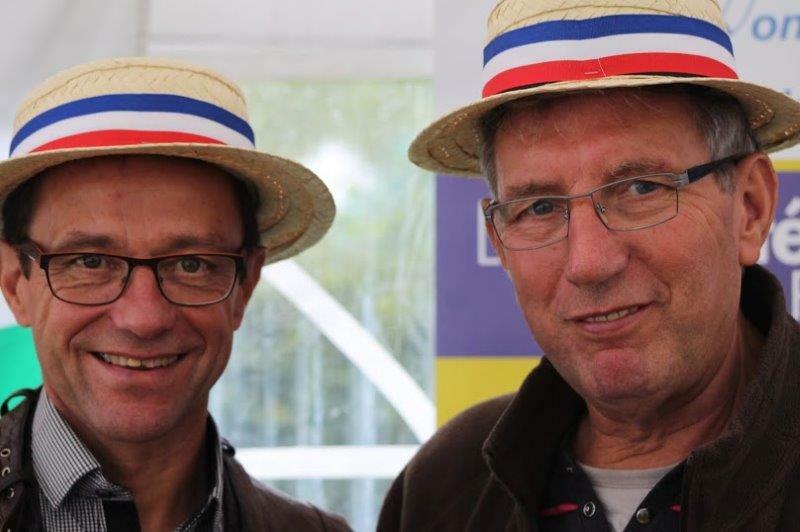 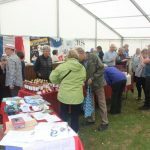 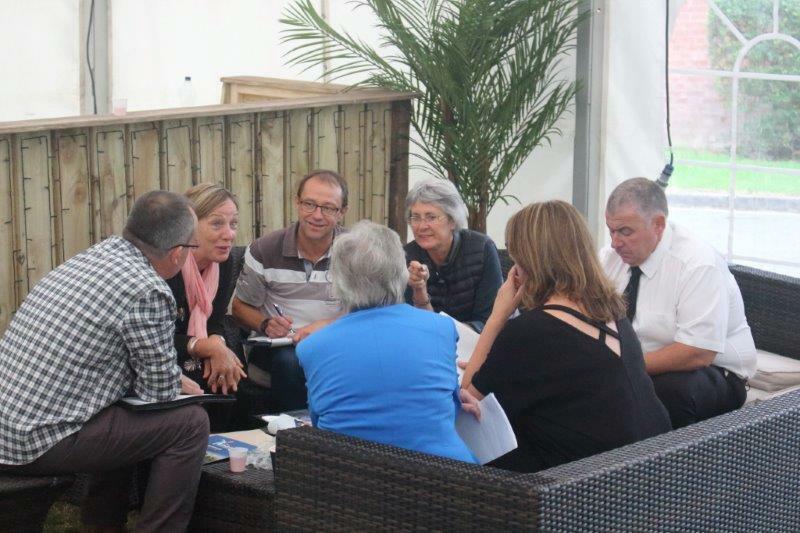 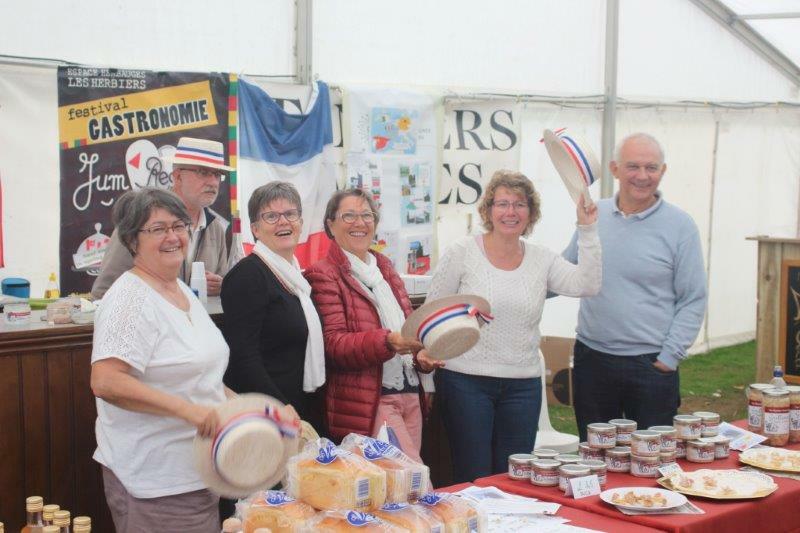 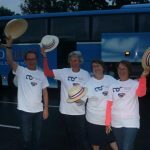 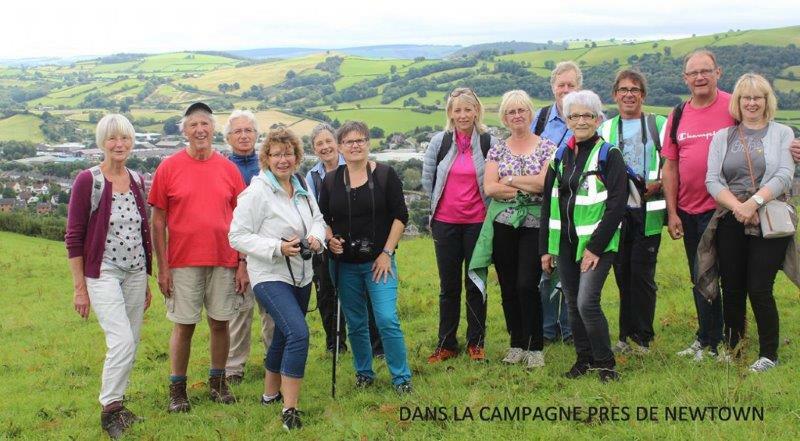 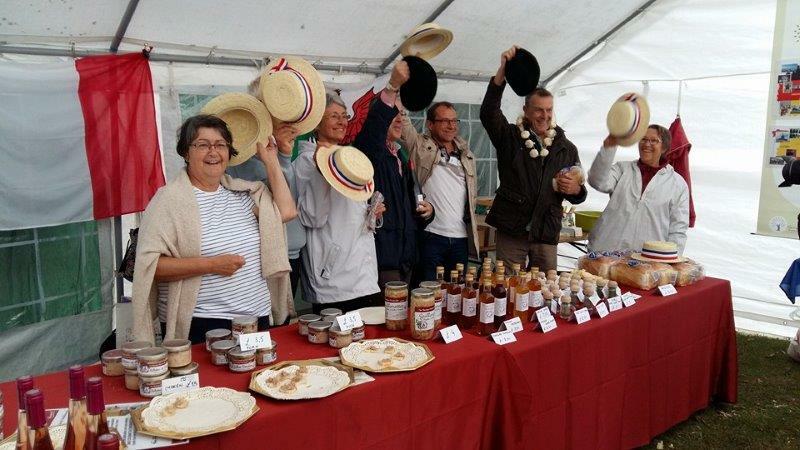 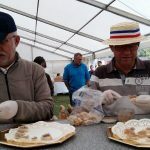 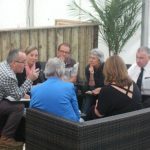 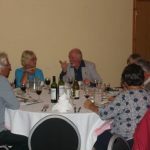 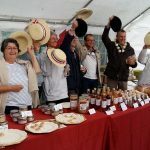 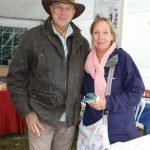 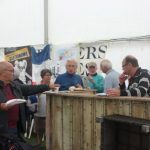 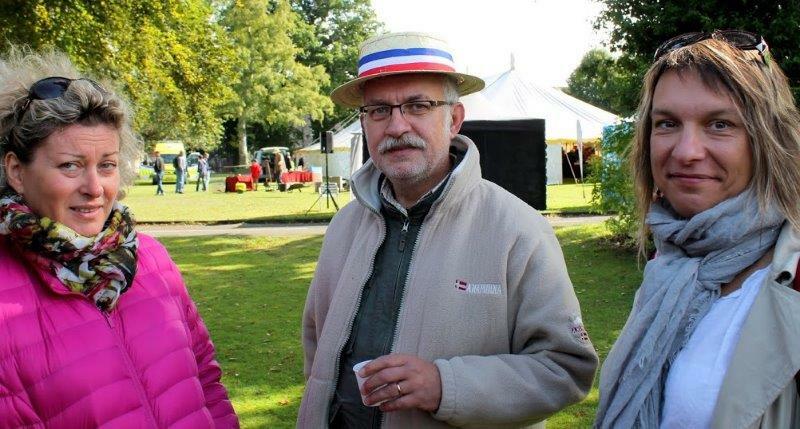 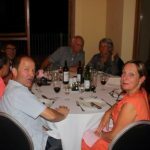 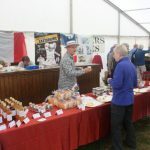 Some would be looking forward to walks with the rambling group, while others were planning to be on the festival site, selling French produce from the Vendée. 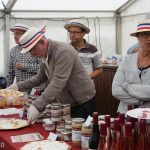 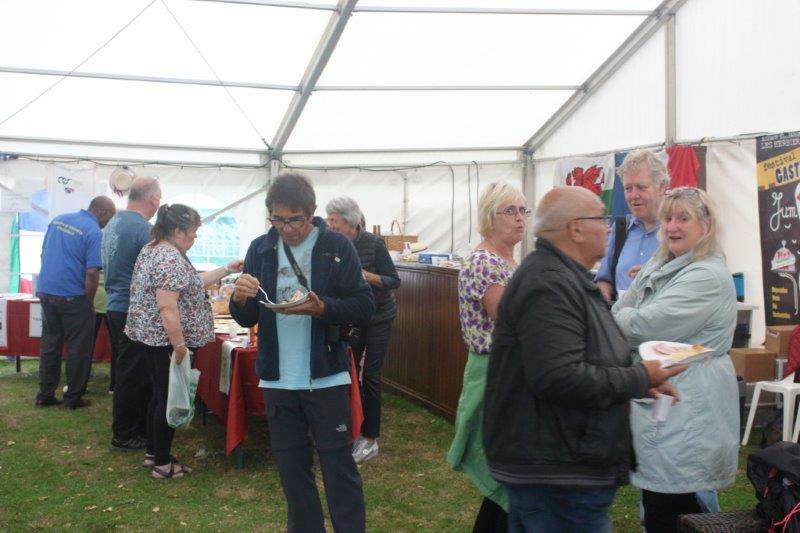 As everyone knows, Saturday dawned in a wall of water and it looked as though people would choose to stay at home, but the clouds cleared away by the afternoon and many people made their way to the French tent to purchase wine, brioches and terrines, as they had done last year. 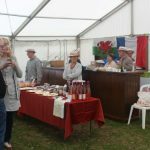 However, not all went smoothly: Welsh weather being unpredictable and contrary, winds blew in from the coast with a vengeance and anyone with a free pair of hands was soon employed in anchoring the tent to the ground. 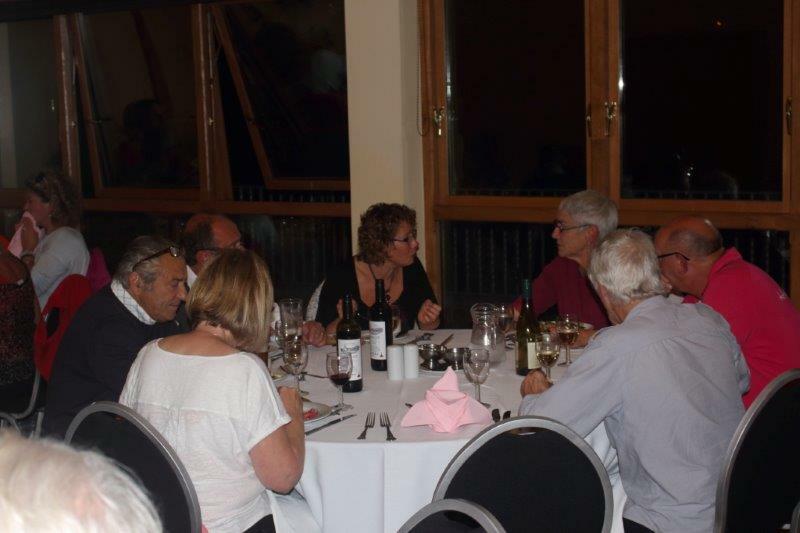 Fortunately, we were saved from sailing away and the wind was accepted as part of the entertainment. 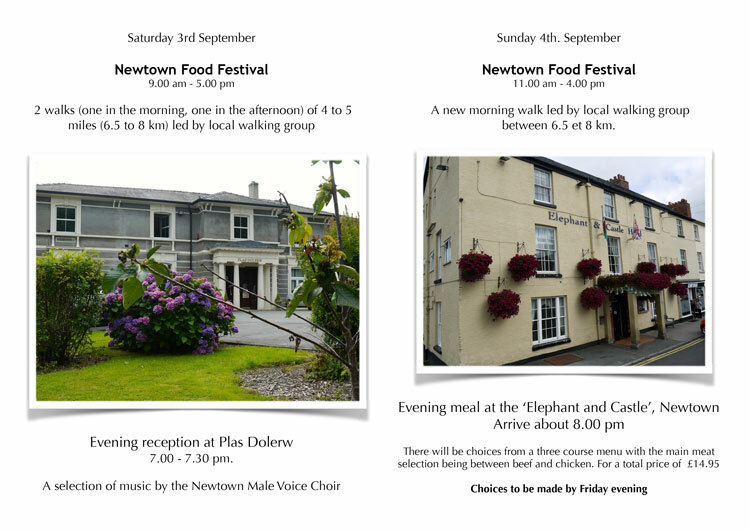 A reception was held at Plas Dolerw in the evening, with a wonderful buffet provided by Duo’s in Newtown. 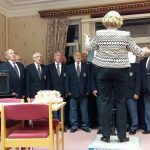 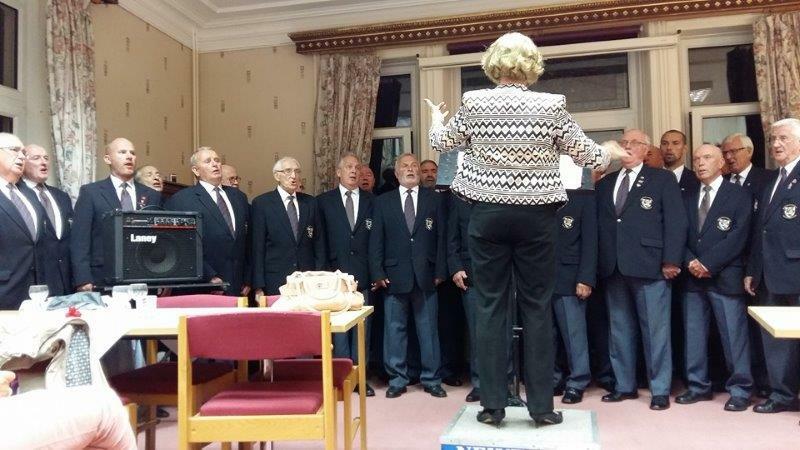 The icing on the cake, however, came in the guise of the Newtown Male Voice Choir, who sang after the meal. 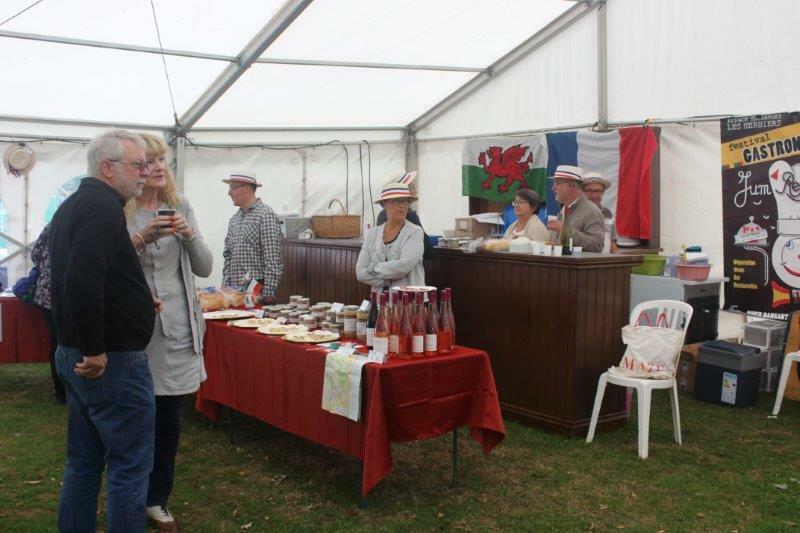 Their singing was sublime and transfixed everyone there, with our French guests clamouring for encores. 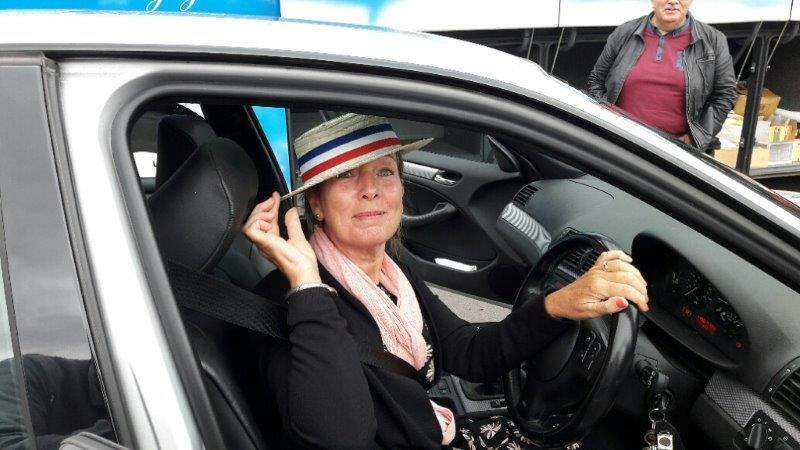 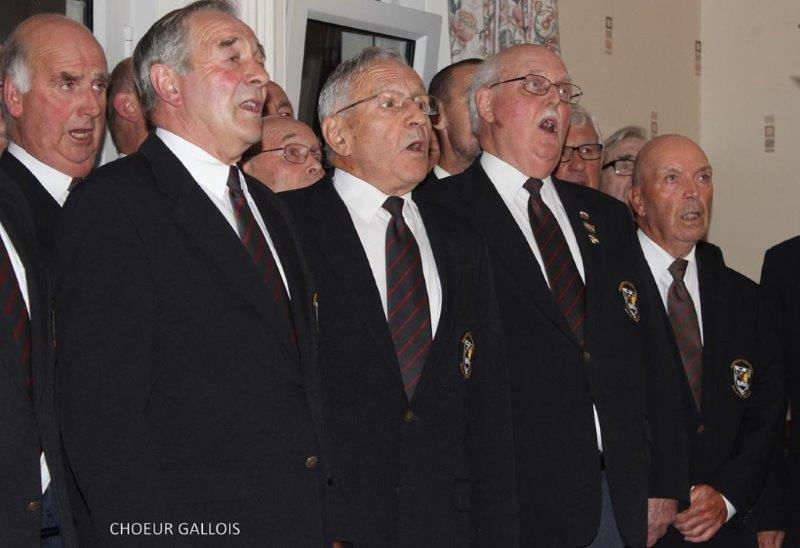 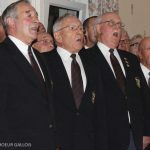 Word perfect, the choir sang the Marseillaise in French, with everyone joining in – [with the tune anyway!] 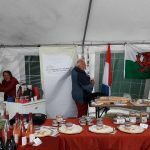 Not to be outdone, the Welsh anthem and God Save the Queen were sang too, rounding off the proceedings in rousing fashion. 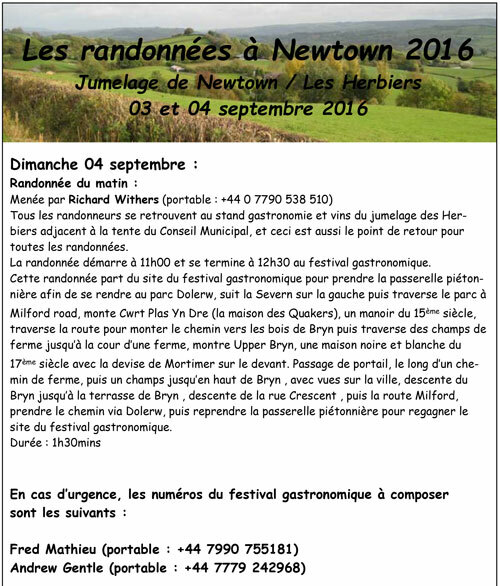 With the choir wishing to perform in Les Herbiers next year, there will be no seat left when they perform. 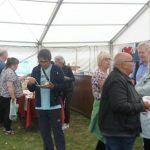 Sunday’s weather was much calmer, creating a more festive air in town. 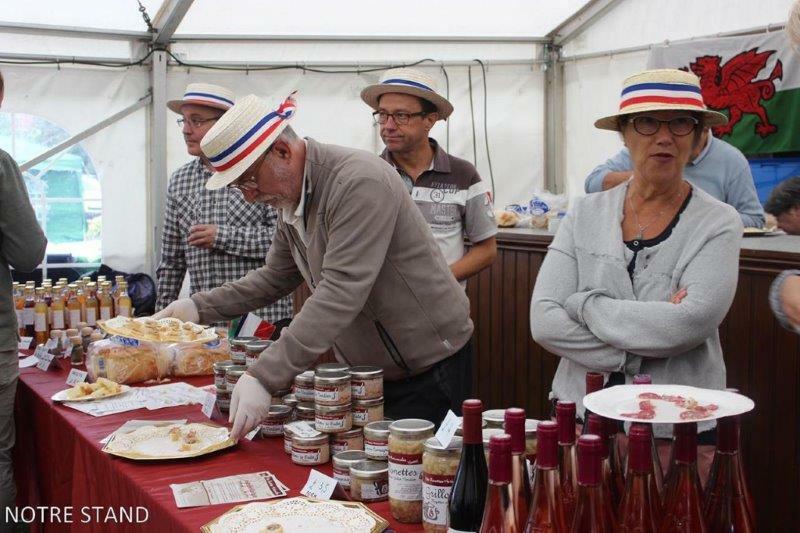 Most of the French produce was sold and it was agreed that instead of waiting to come in 2018, they would love to come again next year. 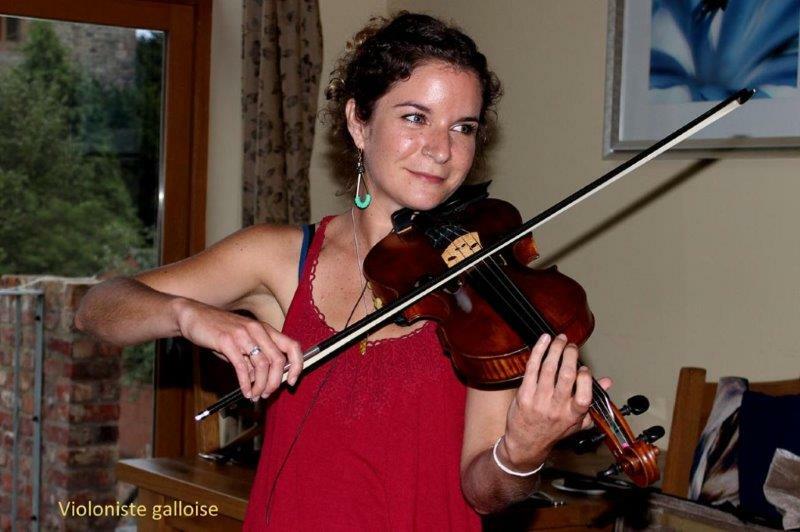 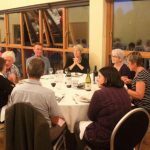 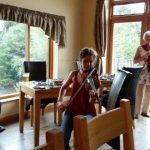 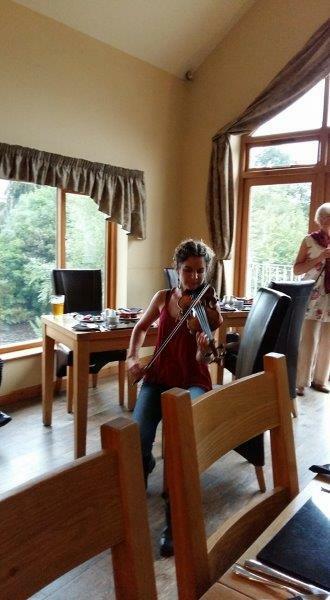 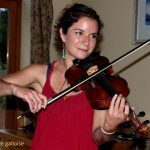 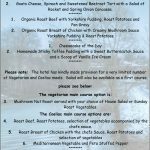 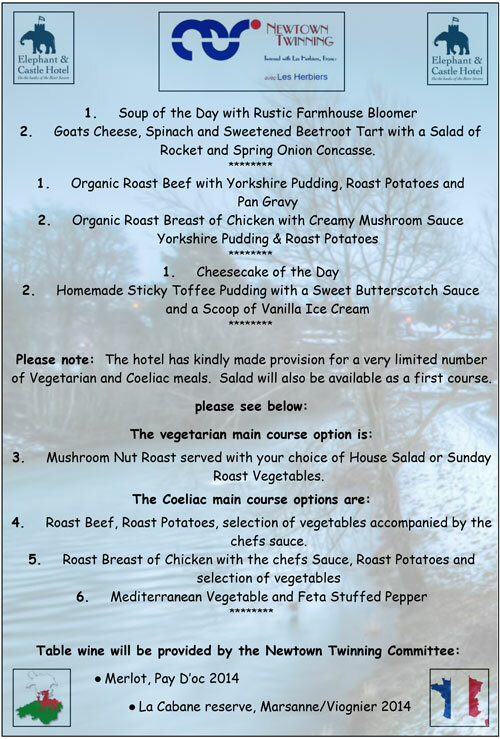 The weekend was finished off by a celebratory meal in the Elephant and Castle, with everyone enjoying the atmosphere of the dining room overlooking the river and chapel, superbly entertained by Anna Beilby on her violin. 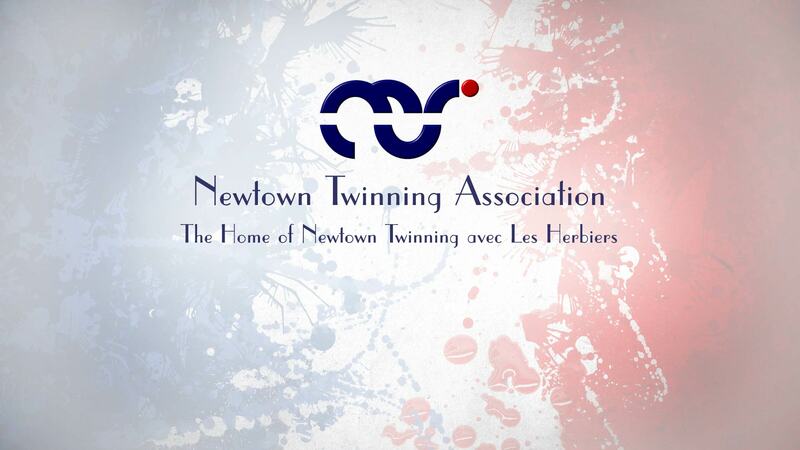 The twinning philosophy continues to grow and several new initiatives are being explored, with links to be created between crafts people, cycling enthusiasts and musicians, education establishments and local trades. 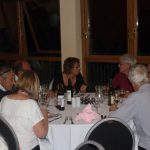 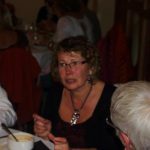 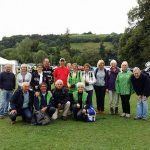 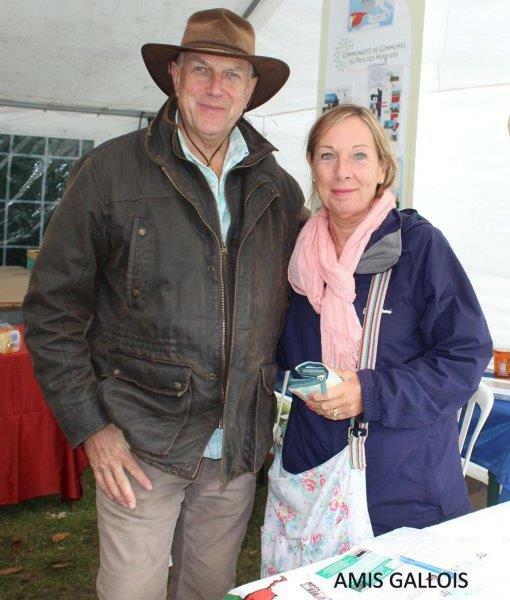 If you wish to become a member of the association, or find out more about their activities, please contact Liz Bushell on 01686 671245.